New Canaan, CT. November 9, 2009 -- Structured Solutions II LLC announced the launch of their newly-designed wheeled snow shovel this fall. The Sno Wovelâ„¢ is the only non-combustion alternative snow removal device performing equal to or better than a snow blower. The all new folding frame Sno Wovelâ„¢ debuts in a new category of hybrid tools, combining safety for the user, protection of the environment and high-performance. No fuel, fumes and deafening noise to harm the environment or the operator "“ no electric cords to tangle with. 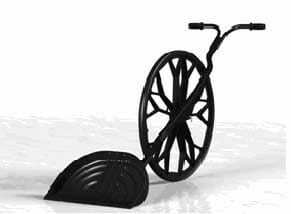 The Sno Wovel is 2-3 times faster than shoveling and comes with a folding frame design for easy and portable storage. This seems like a fairly unsatisfying alternative to a big honkin' snow blower, but I live in Phoenix so what do I know? I very seldom include really long excerpts from articles, but this is perhaps the most telling article I have read to really give you a feel for what the new government ownership of the automakers really means. It sounds crazy: Just a week after the White House scolded Chrysler LLC for relying too much on gas guzzlers, the company is heading to a marquee auto show Wednesday to unveil a new SUV. Chrysler insists the Jeep Grand Cherokee, which clocks in at 20 mpg in its two-wheel-drive version and 19 in four-wheel-drive, is a crowd favorite and a crucial part of its lineup. The White House slammed Chrysler for having a product lineup so heavily weighted with trucks and SUVs. It added that the automaker does not have enough products in the pipeline to meet an expected increase in demand for small cars. Karl Brauer, editor in chief of the automotive Web site Edmunds.com, said it may be hard for Chrysler to please both the government, which is demanding greater fuel efficiency from the Big Three, and its customers, many of whom still demand big cars. "It would be far more foolish for Chrysler to abandon its core competencies in the Jeep brand lineup than it is to come out with a new" Grand Cherokee, Brauer said. As expected, the administration does not really care about the near-term recovery of GM and Chrysler, or, if they care, they are totally ignorant as to the realities of the US car market and the sources of Chrysler's profitability. They care about enforcing a particular political agenda that has little to do with, and may actually conflict with, the health of the company. We have hit a new low when the President of the United States has a strong opinion on and reaction to what car a private company chooses to feature at an auto show. We REALLY have hit a new low when my newspaper thinks its "crazy" that a private company would follow its own marketing intuition rather than the dictates of the US President as to what car they should feature at an auto show. The AZ Republic just assumes the company should do whatever Obama tells them to. "Expected increase in demand for small cars" -- Expected, by whom? Hybrids are currently losing market share. It takes years to develop a new car, so this particular variation of the Cherokee has been in the pipeline for a while, and millions of dollars have likely been invested in it. And the product line makes money, unlike many other Chrysler cars. But the Administration wants them NOT to sell it? It takes years to change a company's auto portfolio, but Obama is going to throw a hissy fit because they have not done it in two months? Don't they know who he is? The article even gives the data one needs to understand why buyers don't share Obama's need to downsize their car. Based on numbers in the article, this SUV uses $235 more gas a year than the Camry (which I guess is a more politically correct car choice). That is $19.60 a month. Assuming a car payment of $450 per month, that is about 4% of the car payment. In other words, the difference in gas use is a TRIVIAL expense for the person who can afford to buy the car in the first place. Over 5 years, the cumulative extra gas to fuel the SUV costs about the same as the 16" alloy wheel option on the Camry. Every day, I have an increasing sense that we are creating a dictatorship run by a grad school public policy seminar. I am sure that Obama really believes, in his heart, that Americans really want smaller cars rather than SUVs. So what? By acting on his own preferences, he is breaking what I call marketing rule #1: Never assume ones own personal preferences are shared by the marketplace. I have been a marketer all my life. As such, one of the first rules of survival I learned was to never overlay my own personal preferences on the marketplace. GM has had this problem for years, with insular design teams locked in some weird 1970s design world. But you and others are simply repeating the mistake, with a different set of perspectives -- you assume your personal preferences in cars represent that of the majority of buyers, and you wish to use the fiat power of government to enforce those preferences. It is a recipe for fiscal disaster. I promise you what people buy, for example, in rural Arizona is not the same thing that people buy in SF, no matter how much those on the coasts want to forget that flyover country exists. I actually think there is decent evidence that a lot of people do want what GM is offering, given their market share. Why do people always say they make cars that no one wants to buy, when they sell 10 million of them each year? I will confess the GM product line does nothing for me, but so what? Others seem to like it, and, unlike many, I don't look down my nose at them for doing so. The problem is not necessarily their product line, but their cost position. The average price of new cars has not risen for 15 years. Much like in computers, consumers now expect ever better cars for the same or lower price each year. GM is still producing cars with a mindset built in an era of a three-company domestic monopoly, where 4% annual price increases were routine. Their competition is producing like they are Dell or Toshiba, recognizing that they are never going to get price increases and ruthlessly driving down costs. In fact, when I look back at almost every "environmentally friendly" alternative product I've seen being widely touted as a cost-free way to lower our footprint, held back only by the indecent vermin at "industry" who don't care about the environment, I notice a common theme: the replacement good has really really sucked compared to the old, inefficient version. In some cases, the problem could be overcome by buying a top-of-the-line model that costs, at the very least, several times what the basic models do. In other cases, as with my asthma inhalers, we were just stuck. Often "industry reluctance" to offer green products is actually industry understanding of customer reluctance to buy them. A huge government make-work program seems to be an odd response to an increase in employment volatility, which is how the problem is framed, even by Meyerson. He calls it our "layoff-prone society." I don't accept that this is necessarily a bad thing, but even if it is, a jobs program does not solve it. Our unemployment today is at a low level (less than 5%) so that the problem, if it exists at all, has to be volatility, not the absolute size of employment. So a jobs program helps, how? I will confess a big government-funded jobs program would reduce employment risk in one way: once someone is hired by the government, whether it be a teacher or bureaucrat, it is impossible short of a felony conviction to fire them, no matter how horribly destructively incompetent they are. So anyone hired by this new job program would have a job for life, I guess, though at an enormous dead-weight-loss of the overall economy. The current economy hovers near full employment. That means that millions of people sucked by the government into an alternative energy program would be pulled out of areas the market currently says is the most productive place for them. Unless the government has identified a massive market inefficiency, such a program will net reduce the productivity and output of the economy. Remember -- these millions of people are likely employed somewhere else today, so those places they are employed either have to scale back or pay more for labor. Does anyone really think the government is going to make the right technology and investment choices in such a program? It will take about 47 seconds before the investment process is politicized and spending is handed out as pork to valued supporters in key Congressional districts. (just look at ethanol and the Midwest Archer Daniels Midland lobby). Remember, the government has been pouring all its investment and subsidies and regulations (e.g. zero emissions requirements) into plug-in electric cars, which still are not there technologically. In the mean time, the market has latched onto hybrids, a technology actually opposed at first by government energy czars in places like California (because they were not zero emissions). Hybrids have done more to reduce automotive fuel consumption than any of the technologies, from plug-ins to fuel cells, that the US government has supported in any big way. Postscript: Yes, I know plug-in hybrids may be here soon, but batteries are apparently still not where they should be. I would love to have a plug-in hybrid. Note, of course, a plug-in hybrid is very very different from a straight electric car, which was the choice of the bureaucrats. Also, I know that some areas have started to subsidize hybrids, for example by allowing their use by one passenger in the car-pool lane. These are late-to-the-party efforts to claim some government credit for a private market trend already in progress. over a decade behind Boeing in new product development. that Airbus is a "European success," but vowed to "defend this model." Now why would a model need defending if it were successful? reverse: spinning gold into straw.